Standing Room Only – community meeting in Benicia – Stop Crude by Rail! 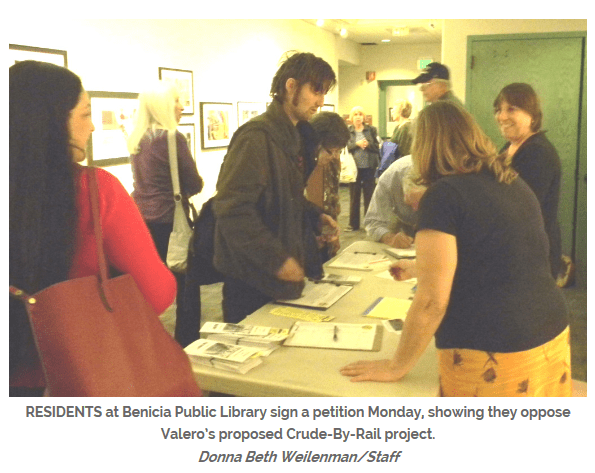 More than 100 people packed the Doña Benicia Room of the Benicia Public Library on Monday night to hear a panel of authors, scientists and organizers urge opposition to the proposed Valero Crude-By-Rail project that is currently undergoing environmental review. Filmed testimony by Marilaine Savard, a survivor of the July 6, 2013 derailment and explosion in Lac-Megantic, Quebec, came early in the program. Savard had spoken Feb. 26 at a similar event in Martinez. Her views of the tragedy that killed 47 people and destroyed much of the town’s business area were echoed by such activists as Benicia residents Marilyn Bardet and Andres Soto, author Antonia Juhasz and Damien Luzzo, a Davis environmental business owner. They urged Benicia residents to join neighbors in other refinery cities who object to transporting crude oil by train. No one from Valero Benicia Refinery, nor anyone who supports its Crude-By-Rail project, spoke Monday. The meeting was one of many rallies, gatherings and activities planned to galvanize opposition to the proposal to deliver domestic crude to Valero Benicia Refinery by train, said Jan Cox Golovich, a member of the steering committee of Benicians for a Safe and Healthy Environment, one of the groups that organized Monday’s “call to action” meeting. The panelists reminded their audience that while Benicia city officials are considering a project proposed solely to bring in 50 rail cars of oil twice a day into the local refinery, the San Francisco Bay Area has other cities with refineries that also could bring crude from North Dakota’s Bakken fields into the area. The problem with the Valero project, as with delivering Bakken fields crude to refineries in Richmond, Rodeo, Martinez and Pittsburg, they said, is that the North Dakota crude has properties similar to gasoline. It is more flammable than heavier “sour” crude such as that obtained from Canadian tar sands. Poured into a glass, Bakken crude resembles light beer, Bardet said, and has a low flashpoint under pressure. In contrast, another panelist, Diane Bailey, senior scientist with the Natural Resources Defense Council, said Canadian tar sands from Alberta looks like dark, goopy coffee grounds or peanut butter. That heavier crude has its own dangers, Bailey said. It, too, can spill, polluting environmentally sensitive lands. It’s dirtier than lighter crudes, with more heavy metals and a higher percentage of other toxins. Valero officials have said repeatedly the Benicia refinery isn’t equipped to process tar sands oil, but Bailey said such crude can be diluted with solvents — chemicals like benzene that pose their own health threats. Juhasz said the ability to drill horizontally and use the same fracking technique that is used to obtain natural gas has opened the Bakken oil fields. A significant amount of that oil is moved by rail, she said, since pipelines aren’t available and the oil fields are nowhere near navigable waters — which has led to a dramatic increase in the number of spills. More barrels of oil were spilled in 2013 alone than were spilled from 1975 to 2012, Juhasz said. Not only do the fracking process and the spills worry her, she’s also concerned that there is little regulation that protects public safety. The country’s older pipelines aren’t much better, and have burst, sending crude into sensitive wetlands, panelists said. The Bakken fields have made North Dakota the biggest oil-producing state except for Texas, Juhasz said. Yet, noted the author of “The Tyranny of Oil and “The Bush Agenda,” the increase in domestic crude hasn’t lowered gasoline prices because much of the oil is being sold outside the United States. Ed Ruszel, whose woodworking company sits next to rails that belonged to the Southern Pacific Railroad when he first purchased his company’s land in the Benicia Industrial Park, said the much shorter trains that operate near his business tie up traffic for 15 to 20 minutes at a time. Those are 15-car trains. Ruszel said the 50-car trains proposed as part of the Valero Crude-By-Rail project would have a greater impact on Industrial Park traffic. Nor does he expect that the Union Pacific Railroad would limit the trains to 50 cars each twice a day. He said he suspects the railroad would bring even more rail cars in during the weekend and let them sit, stored on Industrial Park tracks. Soto, an activist who has moved to Benicia, his parents’ hometown, after working for years in Richmond, said because crude by rail doesn’t just affect Benicia, residents should join their neighbors to prevent train delivery of oil to Conoco Phillips, Shell, Chevron and other Bay Area refineries. He also asked the audience to monitor the Bay Area Air Quality Management District as it looks at the cumulative effects of the change to rail deliveries. “It’s caving to industry pressure,” he said. Residents should tell the agency to do “our will” or get a new staff. If cities with oil refineries have worried residents, municipalities where those trains would pass through also have concerns, said Damien Luzzo, who asked Benicians to object to the Valero project not only for themselves but also for “uprail” cities like Davis. An explosion the size of the one last year in Quebec “would incinerate half of our town,” he said of Davis, which he described as a city with environmental awareness.